On March 3, 2019, Wheeling Village Trustee Joe Vito decided to tell the other candidates running for village trustee how to run their campaigns in respect to campaign signage, where it could be placed, and what he would do with their signs. Vito threatens other candidates that he will remove their signs and return them to the candidates, or if found a second time, he will remove the signs and throw them away. He indicates that he speaks for himself, Dave, and Ray in the email (below). While we can appreciate his zeal in keeping competing signs from getting near his, we suggest he would be crossing the line into theft should he remove signs, or remove them and throw them away. 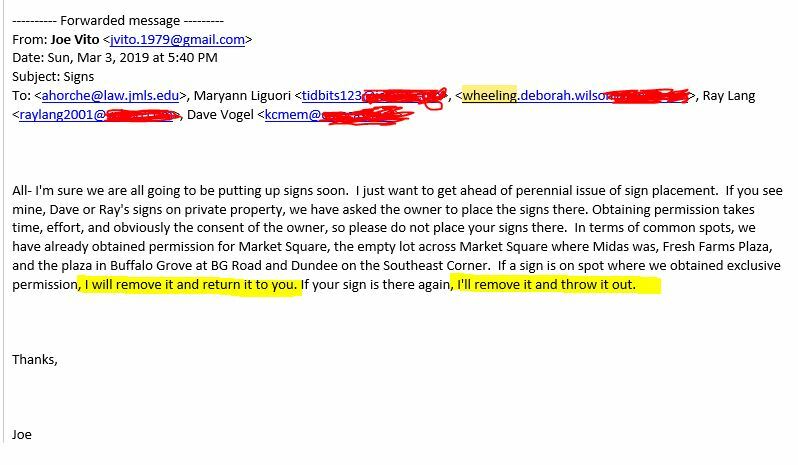 It is up to the property owner to remove signs if they do not want them there, not the competing candidate.